Publication Information: Siloam. 2015. 256 pages. Book Source: I received this book from the author and publicist free of cost in exchange for an honest review. Opening Sentence: "There are many factors in our modern lifestyle that pull us away from the health we want, the health we need to complete our purpose." Favorite Quote: "You have the power to change and heal your body. It starts with what you choose to eat each day." The Juice Lady is celebrity nutritionist and prolific writer Cherie Calbom. She has written about 25 books that have been published around the world. This is her latest contribution to the food and nutrition genre. The premise of the book is that research shows that many health conditions are the result of chronic inflammation in a person's body. Remove the inflammation, and you mitigate or even eliminate the health condition. The idea of "diet" enters in that inflammation can be the result of food choices. Choose the appropriate foods and, correspondingly, eliminate the inappropriate foods, and you mitigate or even eliminate the inflammation. Fundamentally, better eating leads to better health. This is a tenet we all know, and we all should abide by. This book has a specific prescription for what better eating looks like. It contains a 28 day (4 week) plan with menus and recipes. Chef Abby Fammartino has created the recipes for the book. Please note that although Cherie Calbom is the "Juice Lady," this book goes beyond juicing and smoothies. 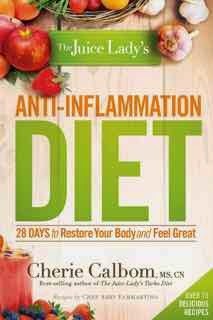 This book is an entire eating plan; it incorporates juices and smoothies, but also many other foods that form the basis of an anti-inflammatory diet. I don't have the scientific knowledge to comment on the science behind the book. Several of the suggestions - avoid processed sugar, avoid processed grains, eat whole foods, avoid genetically engineered products - are the same as in a lot of other research and just common sense. Beyond that, the book presents a discussion of what are considered inflammatory and anti-inflammatory foods. It does suggest eliminate some entire categories of food such as wheat and dairy. However, for virtually every "don't," the book presents a "do" - as in a prescription for what to eat. The presentation of the book is well organized and easy to use. The first chapter works on identifying what inflammation is, its pros and cons, and some of the health conditions that can result from chronic inflammation. Chapter 2 focuses on the causes - food, health, and environmental - that contribute to inflammation. Chapter 3 introduces the foods with anti-inflammatory properties. Chapter 4 is the 28 day plan, laid out week by week with shopping lists, menus, and recipes. The section outlining the 28 day plan is very well organized. The shopping list is organized by categories as a checklist such that it can be copied/printed and used as the actual shopping list. The individual recipes include a clear ingredient list, number of services, and cooking directions. Many also include color pictures, which is always appetizing in a cookbook. The recipes do not include nutrition information; however, that may be because the focus of this book is more on the foods in the recipe not their caloric or nutrient content. Still, that would be a great addition. The recipes also separate the ingredients into what comes from that week's shopping list and what comes from the pantry. This section is not as useful since the complete shopping list and recommendations for a well stocked pantry already appear elsewhere in the book. The ingredients themselves seem mostly to be readily available items (at least where I am.). The table of contents also includes a list of recipes organized in different ways - type of food like smoothies, salads, etc; meals such as breakfast and dinner. I really appreciate having a recipe index as it allows easy navigation to a specific one and provides the list for inspiration. The book does include marketing for the services the Juice Lady offers and some of the products she endorses - more so than just an "About the Author" section. However, these are included in a separate, stand alone section and are not intrusive into the rest of the content. Overall, the book presents a cohesive plan of eating in a well organized, easy to use format. Does it work? I guess you have to try it out for yourself.